The heat in Japan during summer has become worse and worse in recent years, and it's important to know how to prevent heat stroke and dehydration. In this article we'll be introducing some great products you can use to survive summer in Japan. The summers in Japan have been getting worse every year. The highest temperature recorded during July of 2017 in Tokyo reached 35 degrees Celsius (95 degrees Fahrenheit). Sunlight reflects off of the concrete found everywhere in Tokyo, and on top of that, the region has a high humidity that will make it feel even hotter than it actually is by ten degrees or more. In order to prevent heat stroke, staying cool in summer is very important. Today we'll be introducing some great products you can easily find at a convenience store or your nearest drugstore that will help you survive the scorching hot weather in Japan. 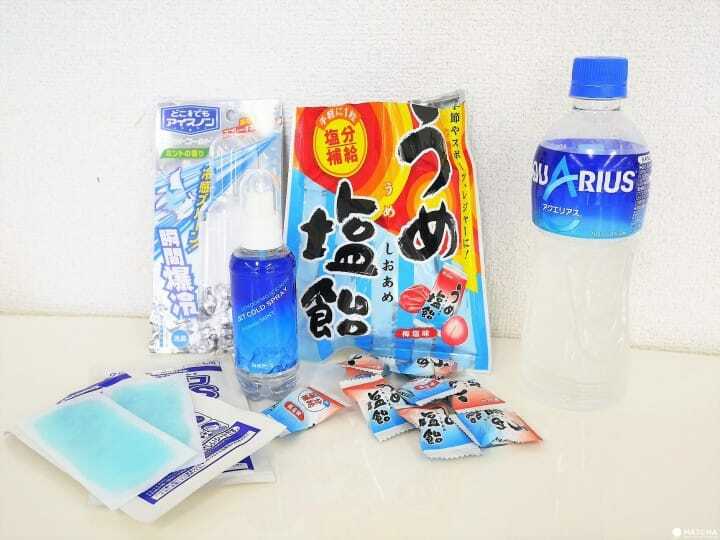 *Products for keeping cool introduced in this article can be purchased for about 500-800 yen (with tax), and products for preventing dehydration can be found at drugstores etc. for around 150-200 yen (with tax). This scarf is made of material that becomes pleasantly cool when wet with water. The scarf uses heat of vaporization to cool down. It's perfect for the body and wallet as it doesn't get too cold, and it can be used over and over again. The Dokodemo Ice Non spray instantly cools you when sprayed from over your clothes. The spray will change the color of your clothes for a moment, but it won't be noticeable in a few minutes. If you don't want to get your clothes wet, you can spray some Dokodemo Ice Non onto a handkerchief or towel and press it against your neck or wherever you want to cool. In Japan, it's a common practice to stick a cooling sheet on your forehead when you have a fever. Cooling sheets are used to take away heat, so they can also be used to cool down on a hot summer day after exercising or walking around. The blue side goes on your skin, so it may make you look like you have a white poultice on. The photo above is the Deko Deko Cool S. Cooling sheets are available from various brands, but most have the same shape. Ask your nearest shop staff member for more information.